Prepare yourself for the wrath of the Norsemen! That is, if you don't mind and it's not too inconvenient...Everyone knows Vikings are ruthless barbarians whose idea of a good time involves pillaging, plundering and feasting. But Thorfinn is no ordinary Viking! He is always polite and happily offers to wash the dirty dishes. Too bad his dad is Harald the Skull-Splitter, Village Chief and the roughest and toughest Viking of them all. Indgar villagers are out watching an elk polo match, the village is attached, and Thorfinn's mum goes missing, presumed kidnapped. Harald, Velda Thorfinn and his boisterous brothers chase the mysterious raiders across the North Sea towards Scotland. 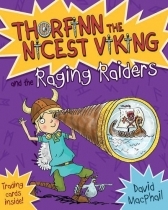 Will Thorfinn the Nicest Viking manage to find his mum and bring her back home safe and sound? 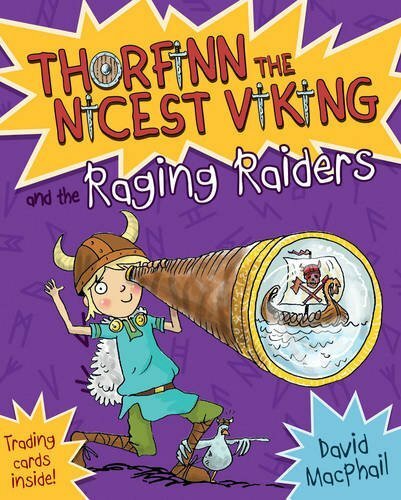 Thorfinn the Nicest Viking is a funny, illustrated, action-packed new series for young readers who love Horrid Henry and Diary of a Wimpy Kid, set in a world where manners mean nothing and politeness is pointless!